Tonight I'll start off by saying do not make my wasabi sauce. In fact, I'll just not include the recipe to ensure you don't. It wasn't bad, but it wasn't good and my chicken is fantastic without it. In that light, let's make a roast chicken. NOTE: This recipe requires six to seven hours of preparation. Bring the water, salt, lemon juice, lemon peel, bay leaf, and thyme to a boil in a large pot. Boil a few minutes and remove from heat. 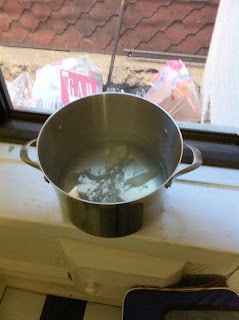 Cool the brine in a refrigerator (or on your winter windowsill as I did). 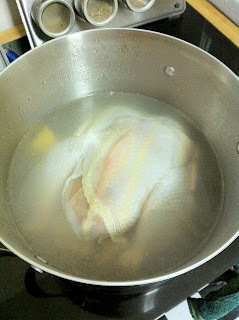 While the brine is cooling, wash your whole chicken. If it has giblets, set them aside for some other recipe. Once washed, place in the brine and soak for six hours. Preheat oven to 375 degrees. 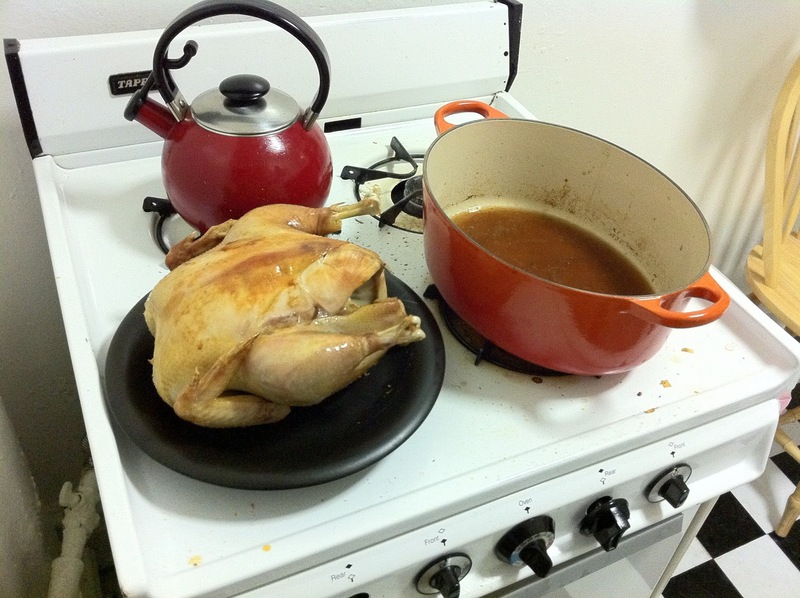 Coat the sides of a dutch oven in olive oil (yes, that's my new Le Creuset dutch oven), and then place the chicken inside. 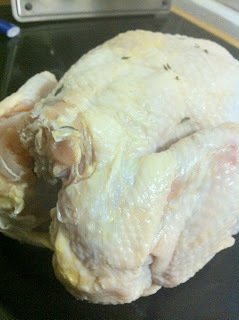 Place cover on the oven and roast chicken for 20 minutes, then add 1 cup of chicken broth. 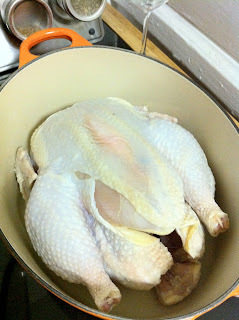 Roast another 20 minutes, then add the second cup of chicken broth. Roast another 20 minutes, then remove cover. Roast an additional 20 minutes or until golden brown. 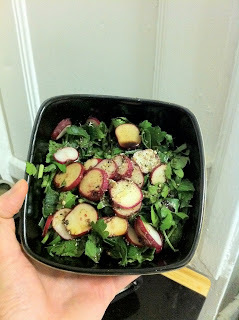 I made a nice romaine, leek, radish, jalapeno, and parsley salad with balsamic, olive oil, and salt and pepper. 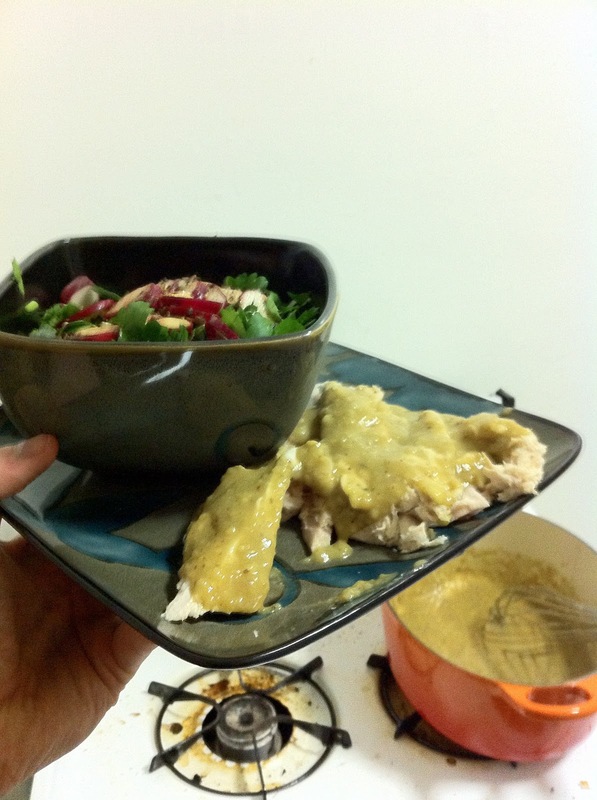 The chicken came out very juicy and tasty with enough juice for gravy. This was my final product, but as I said the wasabi sauce wasn't so good. Enjoy your roast chicken all week as sandwich, stew, or tostada (as I will)! Your soundtrack for this entry: Black Sabbath - Neon Knights. Also, I've made wasabi sauce before (I can't remember what it was for)...but I know I used wasabi powder instead of the pre made sauce. Much better. If you mix wasabi powder with panko and eggs (and probably a little water to make the powder a paste), I'll be it would be delicious.